Coldwell Banker Carlson Real Estate's Stowe, VT Luxury Property Featured on Bloomberg! Coldwell Banker Carlson Real Estate's mother/son team, Smith Macdonald Group had their Luxury Property, Le Château des Monts Verts, featured on Bloomberg, under luxury homes for sale with chef-worthy kitchens. This elegant country property is unique in quality, luxury and style. 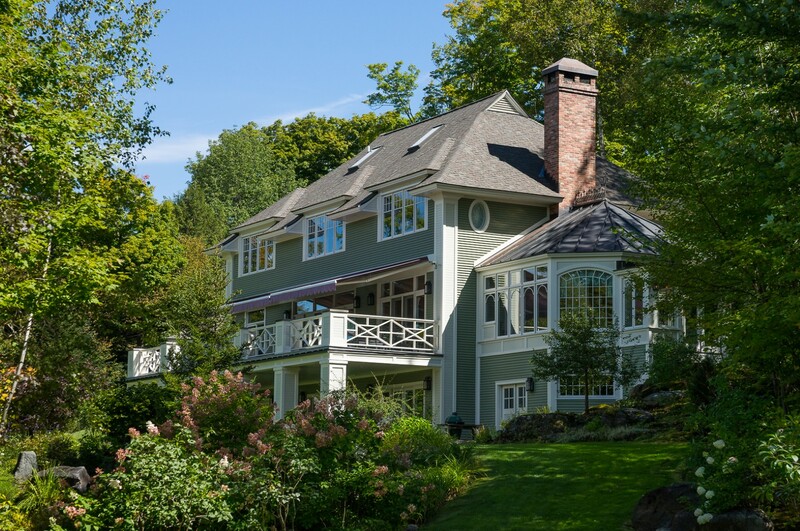 Reminiscent of a home in the French countryside, it was designed by world class architect Bruce Anderson, it is located more than 1,000 feet above Stowe Village and from virtually all rooms enjoy exceptional panoramic views west to the Green Mountains and Stowe Mt. Resort. The property sits just below 13,000 acres of environmentally protected Putnam State Forest providing total privacy. The open main level overlooks the large deck and includes a luxurious chef's kitchen equipped with Meile, Sub-Zero and Thermador appliances, living room, dining room and a solarium that brings the outside in during every season; this main level is ideal for entertaining. From this level one can ascend via a custom crafted grand master staircase to two master suites each with Jacuzzi baths and excellent mountain views. The lower level has a large bath, a home theater with HD and surround sounds, a home office with custom cabinetry and a garden room for flower arranging and potting. This floor includes two very private walk out bedrooms to a large covered terrace. This terrace enters a lovely garden walk to the heated pool and cabana with a half bath and kitchenette. This is a smart house that includes a security system and a premium sound system in the main rooms and deck. This one of a kind home has finishes imported from France, Italy, Brazil and Canada, all blended beautifully with a local Vermont craftsmanship. These unique features, inside and out combine into a truly exceptional country home. Bloomberg Homes for Sale with Chef-Worthy Kitchens. 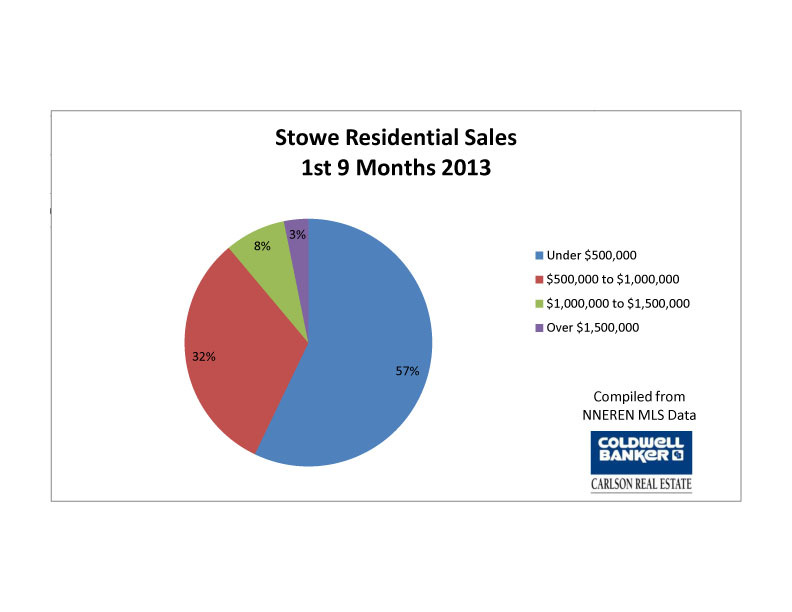 Update on the real estate market in Stowe, Vermont for Fall 2013. 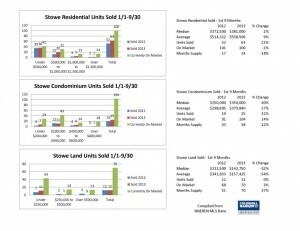 As summer transitioned into one of the most beautiful fall foliage seasons, reports of high visitor traffic, and increases in area business seem to coincide with the increase in real estate activity and sales that we have seen in the Stowe, Vermont area. Don't be fooled by Stowe's small size! 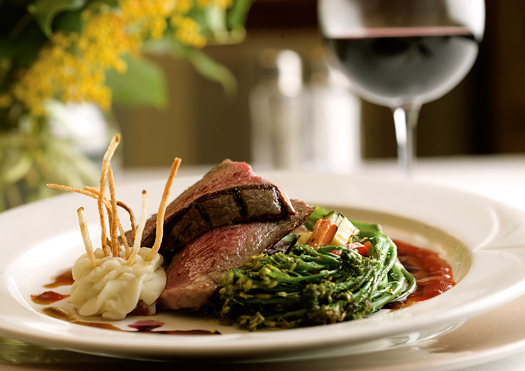 The town is packed with wonderful restaurants that feature a wide range of culinary styles: Italian, Mexican, seasonal American fare, Pacific Rim, sushi... Stowe, Vt has been recognized in such publications as Gourmet, Bon Appetit and Wine Spectator. If you are in town for the week or a local looking for a great excuse to get out, Restaurant Week is your opportunity. For more details and a complete list of participating restaurants please check out the Stowe Area Association website. With the real estate market rebounding, making a strong compelling offer to a seller is more important than ever. As real estate swings back to a more balanced marketplace, or in some communities, even toward a seller's market, the details and the manner in which an offer is made can have a significant impact on how a seller responds to it. While there is no way to ensure that a seller will accept a given offer, using knowledge of their situation and the advice of a real estate agent can make offers more compelling and negotiations yield better results. While home purchases are transactions with large financial implications, the personal element cannot always be removed. Even for buyers who can approach negotiations objectively, they should keep in mind that there is no guarantee the property's sellers can do the same. Emotionally attached. Buying from a seller who may have a strong attachment to the home despite their plans to move out means letting it go can be difficult for them. In these cases, the seller may be swayed not by the price or financial terms, but rather by the home buyers' attitude toward their new residence. If the current residents of a home are emotionally attached, then the key to closing the deal may be in how the buyers treat it. The perception that they will care for the property may be the missing element needed. Such intangible factors are difficult to account for when discussing home sale negotiations, because they vary so much from case to case and are difficult to predict. Focus on the elements of the home that you really enjoy rather than discussing your plans to change decor, design or landscaping. Past experience. Home sellers may also be influenced by past experience. If a seller has had a potential deal called off at the last minute, then certainty of a solid offer can be more valuable than money. Real estate agents are often able to help buyers to read the reactions of the home seller and develop a strategy appropriate to the situation. Their concerns. Another factor in the process influencing home seller is the degree to which they may be preoccupied with other concerns. Moving out of an old home often coincides with other major events, such as settling in to a new job. When that is the case, home sellers are often inclined to make a deal more quickly so they can focus their attention. This may play into buyers' hands and allow them to close a slightly better deal. Understanding a seller's motivation to sell and developing and presenting a compelling offer is the key to success in any real estate market. We are all aware of how dramatically the Internet has influenced our lives in the last decade. The volume of information that flows past us on a daily basis has become almost overwhelming at times. The real estate industry has been greatly effected by this. The amount of information available to both consumers and real estate agents has been a game changer. In the last decade, with the explosion of the Internet and MLS databases, real estate has grown from an industry where agents were primarily aware of their own listings and a perspective buyer had to travel from office to office to find their dream home. Now most consumers have done hours of research online using a variety of real estate oriented websites before they contact their real estate agent. Many of the real estate websites are excellent tools for searching homes on the market, determining mortgage rates, finding demographic statistics and other related information... BUT remember the old adage: Garbage In, Garbage Out. The single most accurate source of information regarding real estate is the MLS (Multiple Listing System) where real estate agents directly enter information on the homes they are listing for sale. The agents have researched the properties, obtained legally binding information from home owners and town offices. This is where changes to a listing will be updated immediately (price changes, contracts, sales, new photographs, etc). Not all websites are created equal. 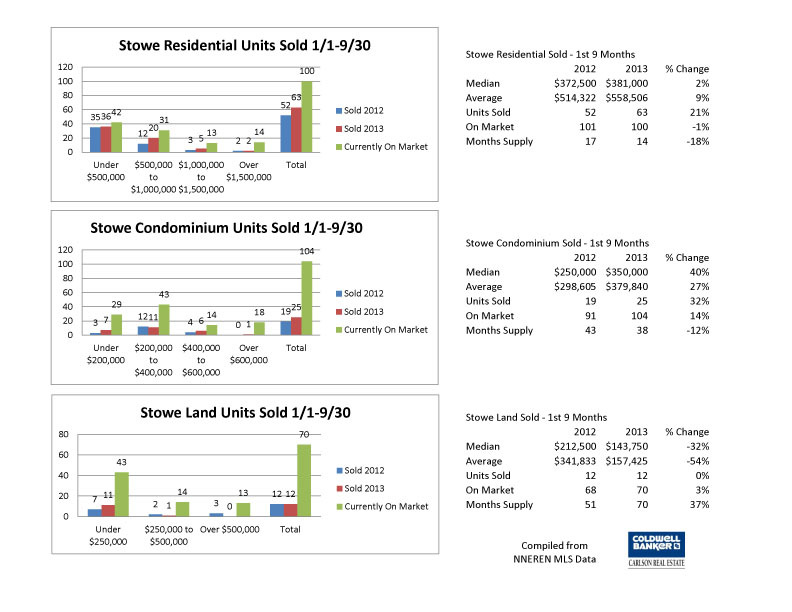 Only websites that receive a data feed from your local MLS will have the most accurate and up to date information. Nationally, the major site to receive MLS data feeds is Realtor.com. Realtor.com is updated several times a day to reflect new listings, price changes and properties that have gone under contract. Many other promoted sites receive occasional updates, sometimes only weekly or even less frequently than that. Locally the most accurate information is going to be found on an individual office site. These sites are built to receive a daily MLS data feed and will display all listings in your area regardless of which office is representing the property. Remember that while the Internet is an invaluable tool in your real estate research, make sure that you are using the most accurate, up-to-date websites. If in doubt, you can always go "old school" and contact your Realtor®. Summer in Stowe, Vermont may be short but it is sure is sweet! Vermont concentrates into 3 months what some areas enjoy over 5-6 months. From June until leaf season starts in mid-September the Stowe Vermont area is hopping with outdoor activities, craft fairs, farmer's markets, music festivals and there is even sometimes a few minutes to just relax and enjoy the amazing lush beauty of the Green Mountains. 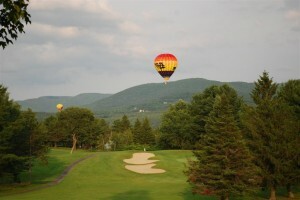 While the Stowe area is a mecca for outdoor enthusists there is so much more to enjoy. Shopping, cultural events, sight seeing, and fine dining. Really the only problem is deciding what where to start.. or to not start, rather just sit back, relax and soak up the beauty of the area. Local favorite activites include the Sunday Farmer's Market at the Red Barn Shops, homemade ice cream in the village at IC Scoops and day hiking in one of the Town forests protected by The Stowe Land Trust. The Stowe Area Association website is an excellent resource for information regarding summer activities (as well as hotel, dining, etc...). So if you only think of Stowe, Vermont for skiing and outdoor winter activities you are missing half the fun! Discover why the locals love Stowe and enjoy living here year round! Coldwell Banker Carlson Real Estate is honored to represent some of Stowe, Vermont's most exceptional luxury real estate. These special homes are included in Previews® International, an exclusive marketing program that represents the most expensive luxury homes in the US and around the world. Representing luxury real estate in Stowe, Vermont. 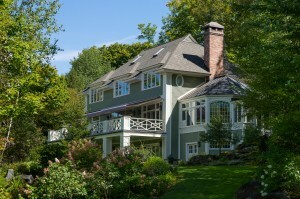 The Stowe, Vermont area is home to many exceptional homes and estates. The natural beauty and recreational opportunities have attracted luxury home owners and buyers for generations. The renewal of the famed Stowe Mountain Resort has ensured that the area continues to be discovered by new generations looking to enjoy what the Stowe area offers. 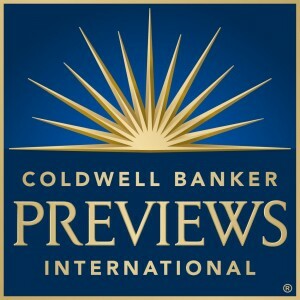 Previews® International has been serving the needs of luxury home buyers and sellers since 1933 and is exclusively available to Coldwell Banker Real Estate and its 82,200 sales associates and 3,100 offices in 50 countries and territories around the globe. Last year Coldwell Banker® agents handled more than 16,400 transaction sides of homes priced at $Million or more, averaging $86.1 Million in sales every day, for a total of $31 Billion in sales volume, an average sales price of $1.93 Million. In the 2012 REAL Trends - The Wall Street Journal report ranking America's top 1,000 residential real estate agents and teams, Coldwell Banker® surpassed all other major real estate brands nationwide with 218 of professionals on the list. Click here for a copy of the exclusive Coldwell Banker Previews® International Luxury Market Report. 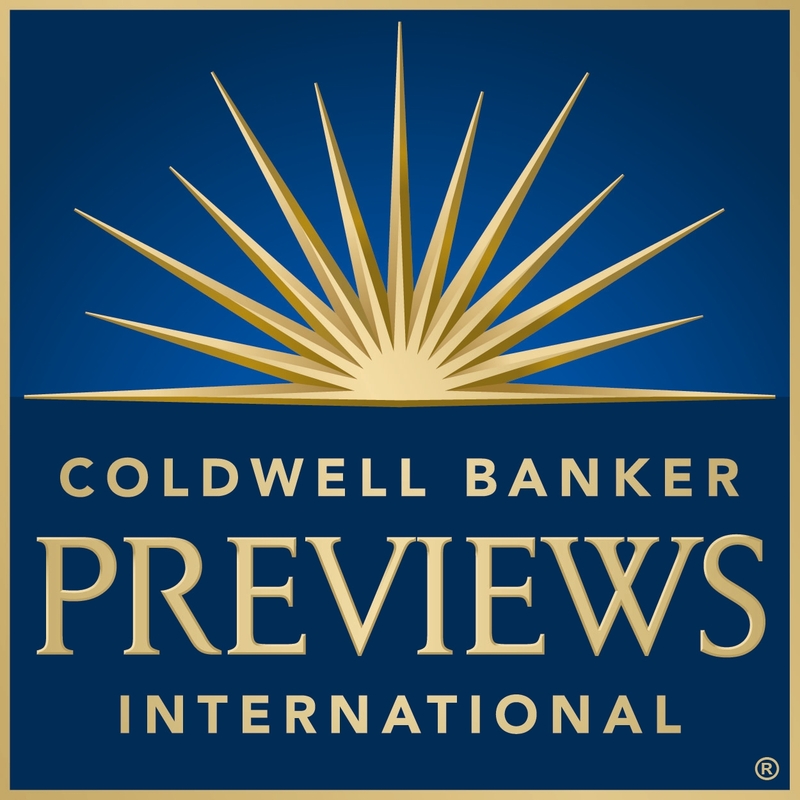 If you are interested in discussing selling your exceptional property through the Previews® International program please contact one of our agents at 802-253-7358. Maple sugar season, Mother Nature's way of easing us through the rough transition from the frozen beauty of winter to the lush greenery of summer. 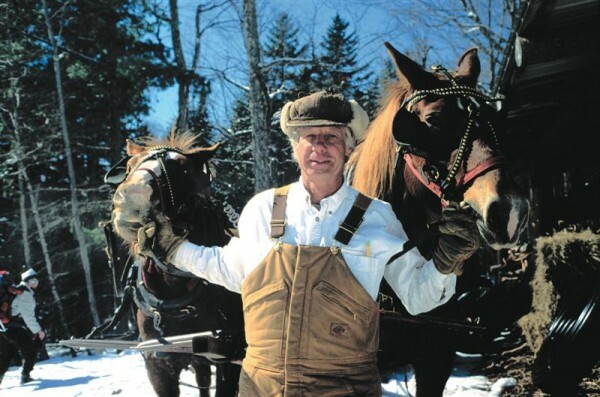 Vermont is world renowned for its maple sugar and rightly so! The annual celebration of sugar on snow is part of that tradition: fresh warm syrup drizzled over mounds of snow, served with pickle to cut the sweet (add a homemade donut if you need more sugar). Or try a maple creeme, maple candy or maple candy. 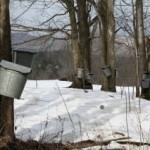 Many sugar houses open their doors during the sugaring season for sugar on snow and as showcase their Maple Syrup producing operations. 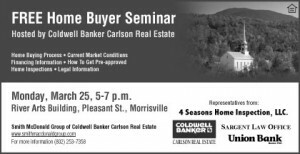 Hosted by Coldwell Banker Carlson Real Estate featuring representatives from The Union Bank, 4-Seasons Home Inspection, and Sargent Law Office. Opportunity to learn the steps involved in the home buying process and current real estate market conditions. Receive financing information and learn how to get pre-approved for a mortgage. Speak with a home inspector to learn the importance of having a building inspection and what to expect during the process. 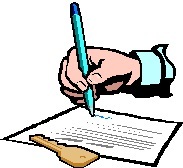 Obtain information regarding the legal details of the transaction. 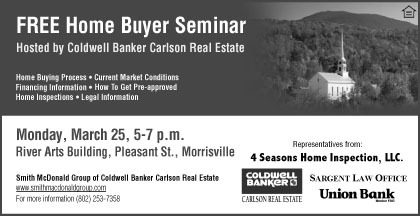 Agents from The Smith Macdonald Group of Coldwell Banker Carlson Real Estate will be facilitating the presentation and will be available to answer any questions. For more information (802) 253-7358. March in Stowe! What a great time of year, the favorite of many locals. Days are longer and warmer; the snow is softer, hero snow we like to call it; maple sugaring has started and mud season is still a ways off. Now is the time to get out for that long backcountry tour or hit the soft bumps on the mountain. This month's calendar is packed with great events indoor and outdoor. Time to shed the heavy boots and coats and really enjoy the last weeks of winter in Stowe, Vermont!